Holder System offers +/- 0.01 in. tolerance in 4 axes. FlexLoc Convertible Holder System for indexing conveyors provides nearly infinite number of interchangeable machined part-holders or cleats that mount on common, extruded urethane profile. Profile is ultrasonically welded to surface of reinforced urethane belt, and mates to slot in bottom of part holder, cleat or part-holder sub-plate. Profile pitch error of +/-0.02 in., inherent when profile is welded to timing belt, has no effect on tolerance when using CTL drives. 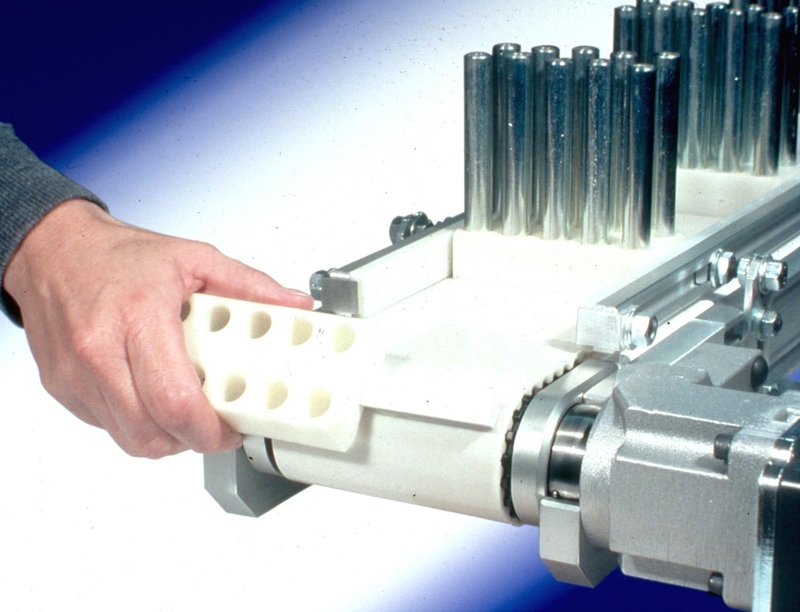 February 2002 - The new FlexLoc Convertible Holder System for indexing conveyors, developed by Conveyor Technologies Ltd., sets a new industry standard in positioning accuracy for low-profile conveyors, with ±0.01" tolerance in four axes. Recently patented, the FlexLoc system gives engineers more design freedom and performance capability for robotic part handling, automated assembly, vision inspection, laser imprinting and packaging systems. Particularly effective at locking in part holders against position error, it still allows holders to be changed or replaced without removing the belt or relaxing its tension. Based on a simple and effective mechanical principle, the FlexLoc system offers a nearly infinite number of interchangeable machined part-holders or cleats that mount on a common, extruded urethane profile. The profile is ultrasonically welded to the surface of a reinforced urethane belt, and mates to a slot in the bottom of the part holder, a cleat or a part-holder sub-plate. Part holders and cleats, machined from aluminum or plastic, are easily installed/removed when over the pulley. There is no need to remove the belt or relax tension when changing holders. When the holder returns to the horizontal position, the FlexLoc profile applies full locking force to the holder. The FlexLoc mounting system virtually eliminates perpendicular error, and greatly improves accuracy in the vertical axis. The profile pitch error inherent when the profile is welded to a timing belt (typically ±0.02") has no effect on the ±0.01" tolerance when using C.T.L. drives. When necessary, Conveyor Technologies offers a part-holder sub-plate that mounts on the locking profile, but allows the part holder itself to be gaged into position relative to other part holders, then locked down. Conveyor Technologies' AccuMove(TM) conveyor with the FlexLoc Convertible Holder System is available in 17- and 25-tooth pulley configurations. Standard belt widths are 50-450mm, with standard lengths of 2-10 ft (special lengths available). The 17-tooth design offers lower cost, torque, inertia, and height, with greater accuracy. The 25-tooth design permits larger welded profiles, tolerates greater side loads, and is suitable for magnetic applications. All AccuMove conveyors use one of three different methods of belt self-tracking. Lateral position of part holders can be further controlled with optional UHMW side rails. Side rails are adjustable for controlling running clearance. Available drives include brushless DC motor, stepper or servo. Sealed-for-life bearings eliminate the potential for product contamination. The FlexLoc system is part of a patented, modular product design that is foundation to 15 different low-profile conveyor types from Conveyor Technologies. The modular system allows great interchangeability of components, and is available in U.S. or metric versions.